This summer, we were thrilled to be joined by a group of law and policy interns from across the nation. 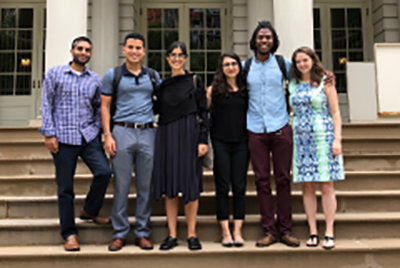 Our intern class became an integral part of the CPD team, providing legal and policy research and analysis for the organization and our network. Our interns worked to develop popular education, viable policy options, and deeper visioning materials for our racial justice, education, voting rights and democracy, economic justice, and worker rights campaigns. The interns’ work covered a range of issues, including progressive policing practices, alternatives to 911, compliance of school discipline policies under the Civil Rights Act, local voting rights, prot-tenant policy options, crafting legal and policy primers related to the Federal Reserve Bank, and right to counsel initiatives for immigrants in detention. The class helped support events in New York and Washington, DC, including direct actions calling for an end to family separation, blocking anti-worker Federal Reserve appointees, stopping a Trump Supreme Court confirmation, demanding an end to the school-to-prison pipeline, and to cease ICE raids in communities. Thank you to the 2018 CPD Law and Policy Innovation Intern Class for your contributions. Please visit our website for a listing of current openings at CPD, including our Law Graduate Public Interest Fellowship program.